The latest architectural addition to Norway’s scenic tourist routes is a rest area featuring a modern toiletfacility that sweeps upwards from a poured-concrete viewing terrace. 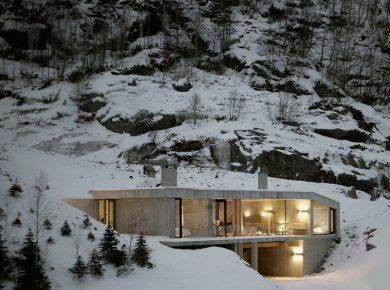 Oslo-based studio Haugen/Zohar Arkitekter (HZA) designed the Ureddplassen rest area for a site along the Helgelandskysten Norwegian Scenic Route in the northern region of Gildeskål. Ureddplassen is popular with tourists and local residents as it provides a beautiful spot to observe the northern lights in winter, and the midnight sun in summer. The entire space has been updated to create a better experience for travellers heading north on the coastal road. The terrace comprises a cast-concrete slab that follows the edge of the curving terrain and separates the freshly re-laid asphalt car park from the adjacent pebble beach. A series of prefabricated concrete steps forms an amphitheatre that extends down from the terrace to the shoreline. The steps are staggered in places to create seating platforms looking out across the water. “The view from the steps is unique and there is ample seating well protected from traffic noise,” said Steinar Skaar, route manager of Norwegian Scenic Route Helgelandskysten. 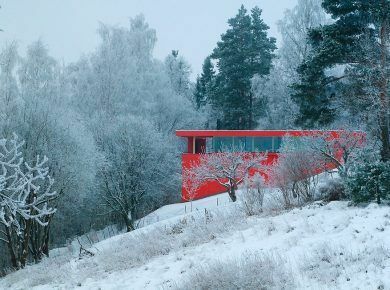 Also we recommend you to check the red house in Oslo.